Allegri – WHAT IS JAMES WEARING? 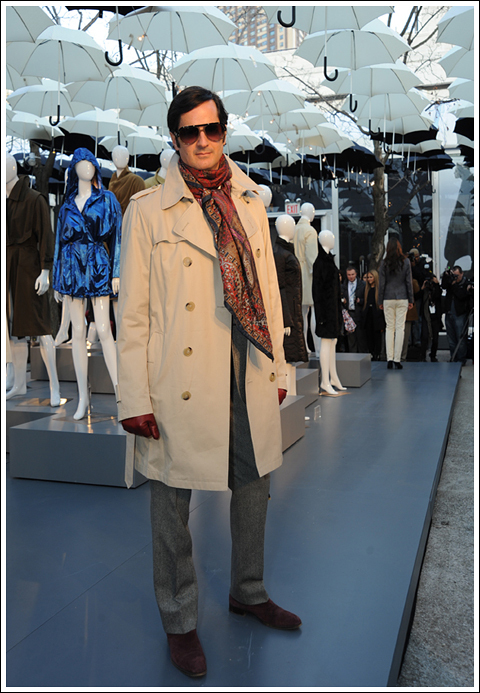 James Andrew at Allegri's outdoor Mercedes-Benz Fashion Week presentation. I used to rant on a bit about how challenging it was to look chic in the rain. Well, thanks to Allegri, I’m finding things a whole lot easier these days! With a winning combination of technologically advanced materials and a fit that is stylishly modern, there’s simply no excuse now for not looking one’s best, even in the most inclement weather! I recently attended Allegri’s spectacular visual presentation at the Mercedes-Benz Fashion Week. As the only brand showing outdoors, Allegri rose to the occasion, producing a stunning runway show (festooned with Allegri umbrellas), and a splendid retrospective showcasing over forty years of Allegri’s all-weather fabulousness. The classic double breasted trench coat I’m wearing (above) is one of their most timeless pieces. It’s constructed from a double twisted cotton gabardine that is treated to be both waterproof and breathable utilizing a special weaving process—and oh is it silky smooth! 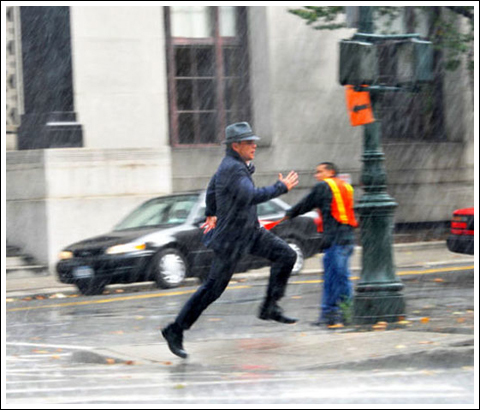 Of course Allegri’s genius has not gone unnoticed in Hollywood, and we’re happy to see that the superb Matt Damon wears an Allegri jacket for a very wet chase scene in the movie, ‘The Adjustment Bureau.’ We definitely approve! I took advantage of the runway to show off my own Allegri trench coat, worn with a Gucci charcoal nail head tweed suite, Turnbull and Asser red and white striped cotton shirt with contrast collar and cuffs, Seaman Scepps black pearl cuff links, red alligator belt with sterling buckle by Ralph Lauren, Charvet black silk pocket square, Sermoneta red leather gloves, Etro silk paisley scarf, Aubergine Suede “Eton” boots by Yves Saint Laurent, Lanvin sunglasses and my fragrance is Creed Windsor.